Have you been doing research on 99 Gage located in Utah United States sells Back Support? If so, read on below to read one buyers experience when trying to buy Back Support. I ordered the wrong size I contacted them via their internal email system.They replied saying to send a photo.I replied saying that I do not own a camera. I heard nothing for a week and contacted them by email a minimum of 8 times.No response whatsoever.I decided to return the item to their address in Utah with a note inserted for correct size.delivery details and contact address/email. I have heard nothing in 8 weeks now! Be careful who you buy from online. These are China based company. Need More Info on 99 Gage? If you need more information, you can click the below links to search for more submissions about 99 Gage on Supplier Blacklist as well as go to the search results page on Google for more reviews online about this company. 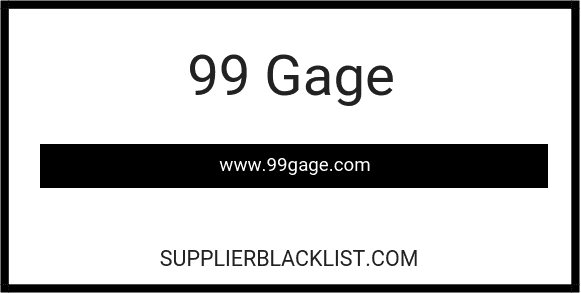 Perform a Supplier Blacklist search for more reviews on 99 Gage. Search Google for 99 Gage Reviews.